Along with conducting a survey of public attitudes toward political engagement and activism on social media, the Center also performed a separate analysis of several Twitter hashtags. First, it examined the volume of tweets using the BlackLivesMatter hashtag and other hashtags related to issues, causes or news events to see how usages differ over time and across issue areas. Second, it conducted a content analysis of the topics that are most often mentioned in conversations around the BlackLivesMatter, BlueLivesMatter and AllLivesMatter hashtags during major news events. Social media use has grown rapidly over the last decade. Today, Americans use a range of social media sites and are increasingly turning to these platforms to get news and information. 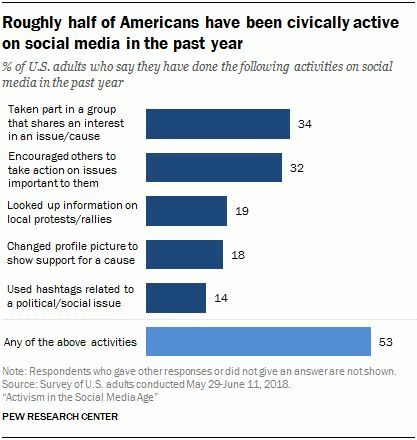 Social networking sites have also emerged as a key venue for political debate and discussion and at times a place to engage in civic-related activities.